China’s plan to launch and construct a space station could be hit by a test flight delay of the launcher designed to send the modules into orbit. An online report by People’s Liberation Army Daily, a military newspaper, reports Lin Xiqiang, deputy director of the China Manned Space Engineering Office (CMSEO), as saying at a press conference in Beijing on Wednesday that the Long March 5B will not make its planned test launch in the first half of 2019. “Due to the failure of the launch of the Long March 5 remote launch vehicle, the first flight of the Long March 5B carrier rocket will be postponed. The specific implementation time needs to be clarified after coordination with relevant departments,” Xiqiang said. The CMSEO manages China’s human spaceflight efforts and had planned a test launch of the Long March 5B before launching the 20-metric-ton Chinese Space Station core module, Tianhe, into low Earth orbit sometime in 2020. The Long March 5, a launcher for missions to Earth orbit and beyond, suffered a failure in its second flight in July 2017, prompting an investigation and subsequent redesign of first stage engines, which were test-fired successfully early this year. It was not stated what has caused the new delay, other than referring to the 2017 failure. Neither the CMSEO nor the China Academy of Launch Vehicle Technology (CALT), responsible for design and manufacture of the Long March 5 and 5B, had responded to a request for comment by time of publishing. The third Long March 5, marking a return-to-flight, had been previously announced to be set to fly around November. A nominal flight is required to clear the way for the test of the Long March 5B variant, as well as launch of the Chang’e-5 lunar sample return mission originally scheduled for 2017. A slip for the third Long March 5 into 2019 appears likely, nudging back the 5B test launch. Yuanwang cargo ships designed to transport components of the Long March 5 from Tianjin, north China, where they are manufactured, to a port near Wenchang on Hainan island, from which they launch, remain moored on the Yangtze river according to ship tracking. After an approximate two-week journey to collect and deliver the components, around two months has previously been required for launch preparations for the 5-meter-diameter, 57-meter-tall Long March 5. When it does launch, the third Long March 5 will carry an experimental telecommunications satellite named Shijian-20, or “Practice-20” in Chinese, based on a new, large DFH-5 satellite platform, similar to the Shijian-18 satellite lost in the July 2017 failure. The DFH-5 platform supports satellites from 6,500 to 9,000 kilograms. Rather than a large setback it is possible the delay is minor, or sufficient to see mission priorities rearranged. The Long March 5 will be required to launch China’s first independent interplanetary mission, to Mars, in summer 2020. With the mission due to reach Mars in 2021 and having been tied to the centenary of the ruling Communist Party of China, proving the Long March 5 may take precedence over the space station schedule. Given the opaqueness of China’s space activities, the knock-on effect on the launch schedule of the space station modules may be very difficult to discern. Namrata Goswami, an independent senior analyst and author, told SpaceNews that a delay may not be significant to China’s plans. “This is not the first time China has delayed a launch. It delayed launching of the Tiangong-1 from 2010 to 2011, the Tiangong-2 from 2015 to 2016. Consequently, a year or two of delays amounts to not much as competitors like India and the U.S. have nothing major planned for the same period. India has announced a human spaceflight ambition by 2022 but it remains to be seen if that is accomplished within the time set,” Goswami said. 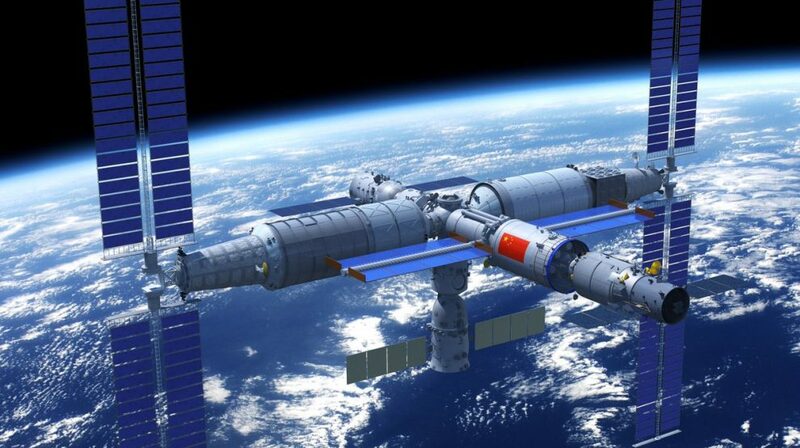 China initiated its three-step plan human-spaceflight program 1992, setting out to first develop a human-rated rocket and spacecraft, orbiting Tiangong space labs as test beds, and finally establishing a 60-100 metric ton modular space station in low Earth orbit. When constructed, China’s Mir-class space station will carry international significance, Goswami said. “First, it establishes an alternate legitimate institutional system that offers the UN and other countries an avenue to carry out space science beyond 2025 when the ISS is likely to run out of funding. Already, China is offering its space station for state-based and academic projects in collaboration with the UN. This institutional building in space is akin to China’s One Belt, One Road (OBOR). “Second, it subverts the position of the U.S. leadership in space and offers a cold-war-like prestige vibrancy to China. Third and most important, once the space station is in orbit, it offers China the capability for deep space exploration, asteroid mining and further[ing] its research on space-based solar power. This aspect must be highlighted as China views cis-lunar space as critical for the ‘rejuvenation of the Chinese nation’,” Goswami noted. CMSEO also announced Wednesday the planned controlled deorbiting of the Tiangong-2 space lab, an 8.6-ton spacecraft which tested advanced life support with the two-crew Shenzhou-11 mission in 2016 and on-orbit refueling and resupply with the Tianzhou-1 cargo spacecraft in 2017, with both sets of tests vital to the future space station. Lin Xiqiang said the space lab is functioning normally and the “temperature and pressure of the experimental cabin all meet the working requirements.” The spacecraft will continue experiments and Earth observation until deorbiting, which will take place in or after July 2019, Lin said. Tiangong-2 is currently in an orbit of 384 by 394 kilometers according to latest information published by the U.S. Strategic Command’s Joint Force Space Component Command, through the Joint Space Operations Center. SpaceNews first reported in June that the orbit of Tiangong-2 had been lowered by around 100 kilometers in an apparent test of propulsion systems. A controlled deorbiting would remove the chances of a spectacle like that of predecessor Tiangong-1’s uncontrolled re-entry into the atmosphere in April this year.